Watch our Chinese New Year festivities! While Hamden Hall celebrates its diversity every day, the month of February is especially enhanced with experiences for students to learn about different cultures, traditions, and observances. From the Chinese New Year to Black History Month, students will engage in programming designed to increase their global awareness. A variety of clubs and faculty members are involved in the planning and coordinating of events, including Mandarin teacher Margaret Wei, the Diversity Committee, and members of MSI (Multicultural Student Interests). Our campus kicked off the Chinese New Year with two cultural performances – one an original first-grade production and the other an all-school assembly that featured an engaging Chinese opera troupe out of New York. A banquet for our international families replete with dumpling-making takes place Thursday, Feb. 7. 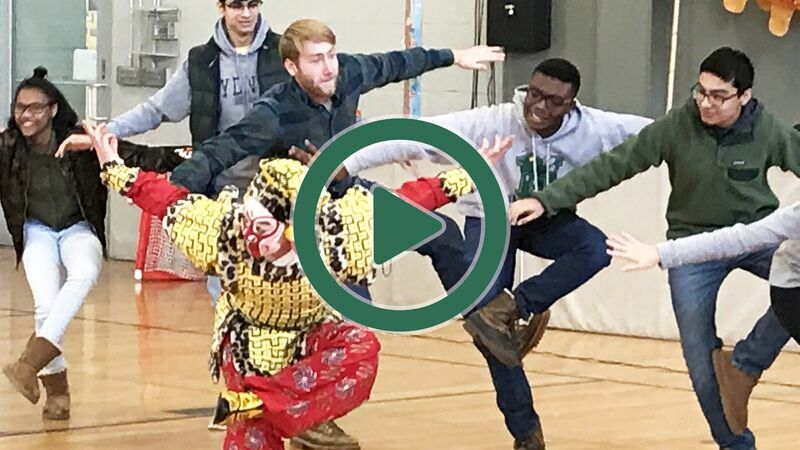 Members of the New York Chinese Traditional Art Center Chinese Opera Troupe dazzled students and faculty with their vivid costumes and special effects for such performance pieces as Face Changing. Following the assembly, which took place in Taylor Gym, students and faculty were still talking about the production and wondering how the performers seemingly transformed their face masks. “The New York Chinese Traditional Art Center Opera Troupe remains dedicated to deepening the understanding and appreciation of traditional Chinese performing arts in global and local communities,” said the center’s artistic director William Chunnuan Liu. Called Amazing China, the goal of the program was to teach about China’s culture and history through interesting performances such as the Peking Opera Long Silk Dance. A traditional Chinese magic show kept students entertained and several Lower School students were brought to the stage area to help the magician with her tricks. Other students and faculty were further engaged in the performance when they were invited to learn some traditional Peking Opera postures and manipulate the ribbons in the long silk dance. Our own students in Grade 1 also took to the Taylor Performing Arts Center stage recently for their production of The Animals’ Race, which was written by English and theatre teacher Lisa Daly. Students were dressed as various animals, including a tiger, snake, and monkey. The tale was spun that a race occurred among the animals as conducted by the Jade Emperor (as played by our own Lower School Director Lorri Carroll). The order in which the animals finished the race was the order they were placed in the Zodiac. One animal, a cat, did not partake in the race and thus is not included in the Chinese Zodiac. The performance concluded with a song sung in Mandarin, which the students learn in their World Language classes with teacher Chien-Ju Lin. Part of a cross-curricular experience, the play was just one initiative that introduced students to the Chinese culture prior to the Chinese New Year. In art class, the students also created Lion Masks with Lower School art teacher Sue Bennett, which are now on display in the Lower School Art Gallery. For the past three years, Mrs. Wei has hosted an after-school international student banquet to celebrate the Chinese New Year. Local international families are invited to bring homemade food for the festivities and the highlight of the event is the dumpling-making that goes on in the Lender Refectory kitchen! Later in the month, different events and programming will honor important people and happenings in the history of the African diaspora, according to Diversity Committee co-chair Yasmin Haque. Upper School students will hear from New Haven Police Chief Anthony Campbell, MSI Committee members will perform for their classmates, and Middle and Lower School students will be treated to Soro Vindi, a performance of traditional Ghanaian dances, songs, and stories. To conclude the diversity celebration, the last week of February will feature a celebration of cultural foods at lunchtime, including Asian, Caribbean, Middle Eastern, and French. “February is a month dedicated to celebrating many cultures and the students at Hamden Hall will experience a variety of different traditions and observances throughout the month,” maintained Diversity Committee consultant Robyn Teplitzky.